“GUILTY CROWN”, first, the title got my attention so I clicked and read the plot. At first it was “ok, virus in the future, nothing special” but then I read “the ability to extract weapons from his friends”… wait what? whoa! that’s new (for me) then it totally got my interest. I checked the PV and it look’s awesome. Nice drawing, cool concept, awesome effects, it’s definitely something to look forward to. 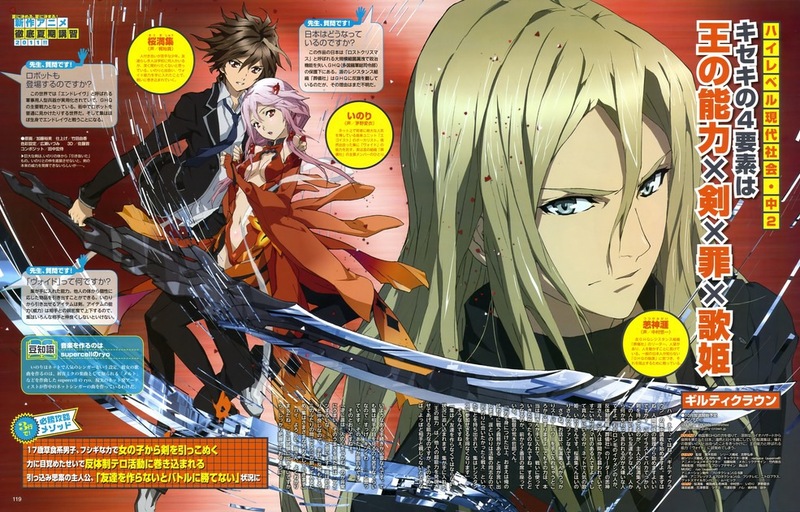 Guilty crown will be released this month, October 2011. Plot Summary:After the outbreak of the unidentified virus “Lost Christmas” in 2029, Japan has been under the control of a multi-nation organization called GHQ. Ohma Shu is a 17 year old boy who has a psychic power in his right hand. He can use the power “Ability of King” to extract tools or weapons from his friends. He has been avoiding making trouble for others but his life changes when he meets a girl Yuzuriha Inori, a member of a resistance guerrilla group called “Undertaker”, whose members pilot mecha weapons to fight against the government.